Now that the clocks have sprung forwards an hour, the nights are getting shorter and actual blue-sky days are no longer a rarity, many of us will be turning our thoughts to the impending Summer and the much-needed fortnight’s holiday, spent according to budget. Given the continuing economic climate many will opt for the perfectly lovely ‘staycation’ hoping to avoid the midgies, raindrops and gales most commonly associated with the typical Scottish summer. The alternative of spending two weeks in sunny Spain is an option, but one fraught with the possibility of accidentally bumping into Murdo Fraser. Duncan Hutchison is hoping his summer break comes to a successful end when he arrives at the harbour in Lochinver, just in time for the Assynt Highland games on August the 10th, all the way from the Manhattan Yacht Club in New York. Duncan isn’t a member of the prestigious yachting club, nor is he sailing. Instead he’s getting home under his own steam and rowing the 3,500 miles Atlantic solo crossing from West to East. The North Atlantic route is reckoned to be the most arduous of Atlantic crossings, notably confirmed by the fact that more people have walked on the surface of the moon than have successfully rowed this route. A look at the history of Atlantic rowing finds many hardy souls who have rowed solo, in pairs and as foursome. The vast majority of them row East to West, setting off from the sunny Canary Islands and eventually end up berthing in Nelson’s Dockyard English Harbour on the isle of Antigua in the Caribbean. Scrolling through the biographies of those who have completed the T*lisk*r Whisky Atlantic challenge, one is left with the impression that this is a task undertaken by those who have achieved many of their goals in the corporate world and are now looking to conquer new personal goal horizons. I doubt many of them struggle to fund the £10,000 entry fee or the average £100,000 cost for a purpose built Atlantic rowing boat. Duncan has opted for the much harder route and, being a canny feller who can turn his hand to almost anything, has hand built his 21-foot-long clinker style skiff. Forget Kevlar and carbon fibre, this a boat built entirely from wood and scavenged conveyor belts bits for roughly the same amount as the entry fee to the above mentioned T*l*sk*r Challenge. Think Graeme Obree’s world hour record breaking bike built with washing machine parts and you get a picture of Duncan’s inventiveness and determination. Three years planning and building have gone into building ‘Sleipner’, named after the eight legged horse of Norse legend. Duncan reckons the journey will take about 100 days and approximately one million strokes of his oars. Even the oars themselves are handmade at a cost of roughly £60 each compared to the £600 each for the sporty carbon fibre ones. His routine over the 100 days will involve two hours rowing followed by two hours sleep, 24 hours a day, every day for 3,500 miles. Opinion in Assynt regarding Duncan’s adventure vary from the expected, ‘he’s off his rocker’ to the coarser ‘he’s got balls of steel’. The reality is probably somewhere in between. Duncan is fully aware of the risks, however as a dedicated chap with an iron-will he recognises that the mental strength required to take on this challenge is every bit, if not a bit more, than the physical. As we chatted, I breenged clumsily into questions about the difficulties he’ll face, loneliness, isolation, the very human frailties that make such a task onerous. Duncan spoke around the question giving a selection of answers about being comfortable in his own skin, wanting to create a good yarn that a lifetime of fishing had prepared him for. A few days later he emailed with something he’d forgotten to say and I suspect had taken time to reflect on. 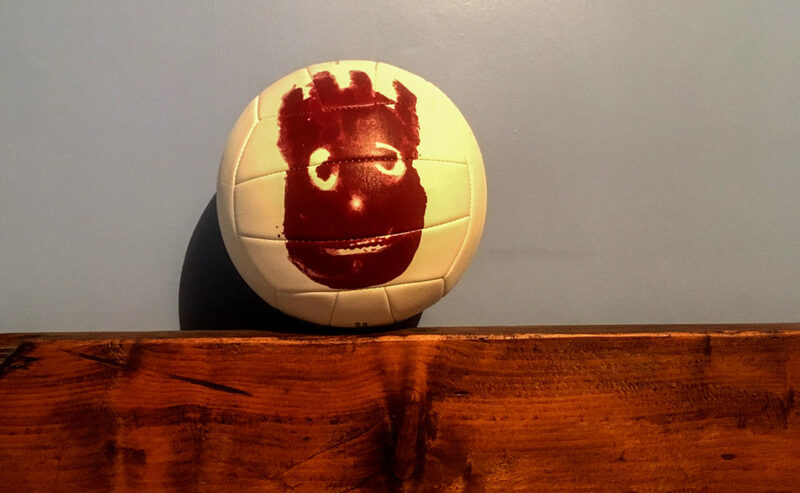 His daughter Franci has bought him a copy of the Tom Hanks film, ‘Cast Away’ and naturally with a nod to the film, a volleyball. Which they have duly named Wilson and who will be joining Duncan on the crossing. One can only hope he doesn’t fall out with his inflatable companion. 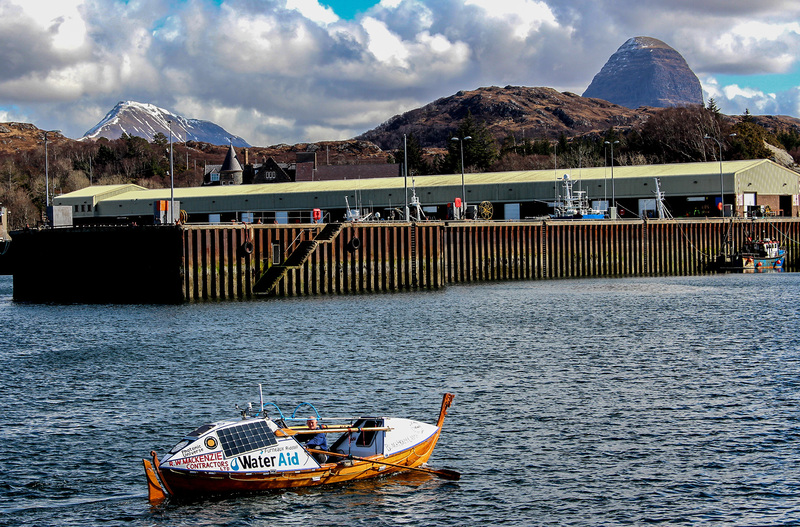 On the practical side Duncan trialled the boat on the Minch with a relatively short hop to Ullapool, its self-righting abilities have been tested and Duncan has been knocking out 20 kilometres a night on his indoor rowing machine. Physically and mentally he’s ready. In case you’re thinking this is some landlubber with delusions of grandeur, Duncan has had a lifetime of experience on the water in the worst imaginable situations. 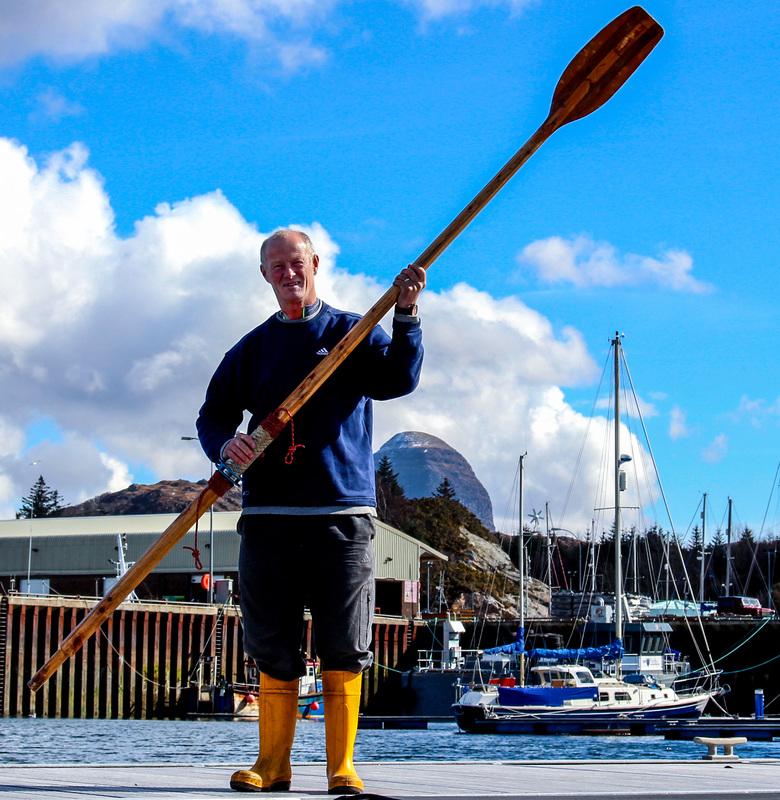 Twenty years as a volunteer with Lochinver RNLI and a career off-shore that has taken him around the world several times, he’s no stranger to what mother nature can throw at the unsuspecting and unprepared. I digress and seek your forgiveness, however, one would surmise that having accepted the challenge of taking on such an arduous task as single-handedly rowing across the Atlantic Ocean, Scottish sponsors would be throwing their largesse like confetti at Duncan to ensure maximum branding and give him some tacit support. Duncan wrote to many of the distilleries peppered throughout Scotland…not one of them replied. He even tried those purveyors of our other national drink…their non-existent response left him somewhat flat. He didn’t recognise that although a massive employer in Scotland and a huge contributor to the Westminster treasury, these global brands have next to nothing to do with Scotland, other than produce the essence of their profit through advertising campaigns that rely entirely on the scenery of Scotland. Duncan hopes to leave the Manhattan Yacht Club on May the 2nd. He has no connections to the club other than they were so intrigued by his challenge, that they have offered to support him by collecting ‘Sleipner’ when it arrives in New York via container ship later this month. Read more about Duncan and the challenge ahead on his website here. Duncan’s wife, Marianne will be updating his progress via their Facebook page here. Also do donate to WaterAid, via Duncan’s justgiving page here. Best wishes for your adventure!